"Staggering amount!" is probably what you will say as you glance past the figure, but not just yet. Probably soon, if you take what was reported in Business Times at face value. The RM2bil worth of investment in solar-based projects in Sabah is expected to be rolled out in stages and it certainly buds well with the country's pledge commitment to reduce carbon footprint in Malaysia. First, it was the rural electrification initiatives by the relevant Rural Development ministry, quickly followed by enactment of two important RE-related acts by KeTTHA to implement FIT in Malaysia, and latest is the effort by Sabah Parks to install a solar hybrid system in Pulau Gulisaan. The latest effort Ministry of Tourism, Culture and Environment Sabah is indeed commendable. The 6kWp Solar Hybrid system in Pulau Gulisaan will essentially light up the small 'turtle' island 24 hours a day. 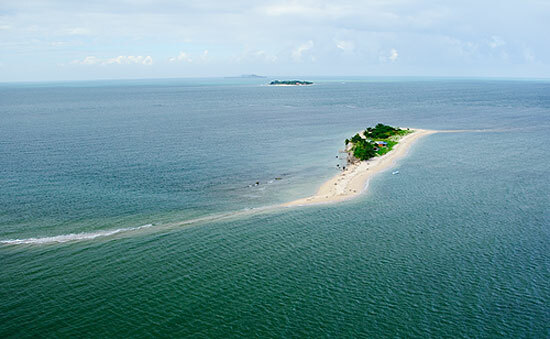 Pulau Gulisan (one of the three Turtle Islands - the others being Pulau Selingan and Pulau Bakkungan Kecil) is only 1.6 hectares in size and is the smallest of the three islands. Much of the land has eroded away leaving only the central portion still under vegetation. Hawksbills (turtles) prefer to lay their eggs on Pulau Gulisan where the type of beach and vegetation are particularly favourable. and the Tun Sakaran Marine Park - soon to commence. This is indeed a wise move by Sabah Parks as it will spearhead the state, together with the other departments, to the front line of RE initiative. It showed commitment and action by the ministry. The downside is the lack of effort to educate the public - the rural population in particular - on how to appreciate and maintain the solar power systems. The solar panels and energy storage battery normally last more than 20 years with proper maintenance. As the saying goes, to know is to love, if the people know little about the equipment then it is hard to expect them to appreciate them, and to care for them. Hello. I like your page. Read about the Pulau Gulisan solar hybrid project on your site saying the system was 6kWp but when I checked on Compugates web site, and other newspaper postings, the system was quoted as 6kWh. If the system is for "round the clock" then this means the peak output would be only 250 watts. Interesting to know what is the actual spec. Keep up the good job of sharing good information on your site. Regards! Hi Wesley. Thanks for your feedback. I believe the peak output is 6kW as a 250W can be generated from a single 1100mm x 900mm solar panel and could be bought for less than a couple of thousand of Ringgit. For a 6kWp system that would roughly be RM180,000. If they decide to keep minimum load at night, it could be less than that. In the case of Pulau Gulisaan, the committed cost is RM270,000; just about make sense. I could be wrong though, but will keep an eye on the development.